MHY 536 - Addressing preparation for setting of an address,parameters and inspection of detectors | LITES Liberec s.r.o. 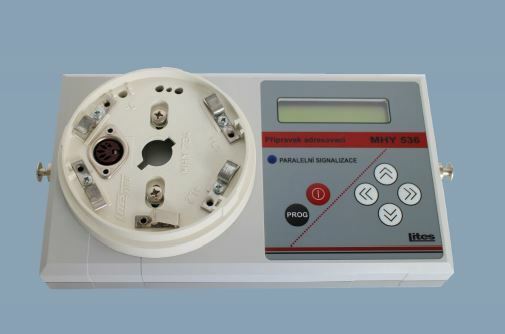 The MHY 536 Addressing Preparation is a service preparation intended for setting of addresses and parameters of interactive detectors in the Electric Fire Detection and Alarm System LITES. Can also be used for checking of automatic conventional detectors. The preparation is intended for change of an address, parameters and checking of interactive fire detectors, interactive action units, addressable unit, technological units and linear smoke detector of analogue fire detection and alarm systems LITES. Allows checking of quiescent current of all detectors and motoric adjustment of optics in linear smoke detector MHG 664. Can also be used for checking of older types of addressable and nonadressable detectors. alphanumeric LCD display 2 × 16 characters. Adjustable parameters offered by MHY 536 for particular types of interactive detectors are the same as those offered by configuration program for analogue addressable C.I.E.s. To the interactive detectors (active elements) can be assigned an address in the range from 1 to 128. Note: When connecting to C.I.E.s MHU 110, MHU 111, MHU 115, MHU 116 and MHU 117 the detectors are primarily adjusted by C.I.E. according to setting in cofiguration program. With the preparation it is possible to do measurement on a line that allows checking of addresses of line elements including adjustment and state of addressable and interactive elements. Product is intended for operation with safe equipment in sense of ČSN EN 60950. Note: When measuring parameters of detectors the environment must be without presence of smoke, aorosols, technical gases, water dew, dust and other impurities. When measuring ionization detectors the air flow must not be faster than 0,5m/s.